Thailand is grouped among 'progressive prosperity' countries that have largely eliminated extreme poverty and fostered a large middle class, says the World Bank. Source: World Bank development indicators. Image: Bangkok Post Graphics. 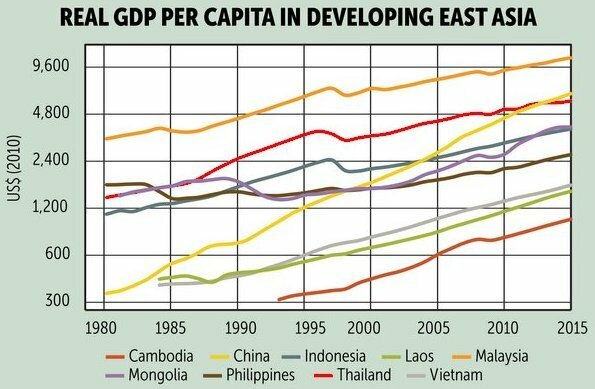 "[Thailand] can prioritise meeting the growing aspirations of the middle classes while mobilising and using resources to address remaining disparities," the global lender said in its report "Riding the Wave: An East Asian Miracle for the 21st Century". 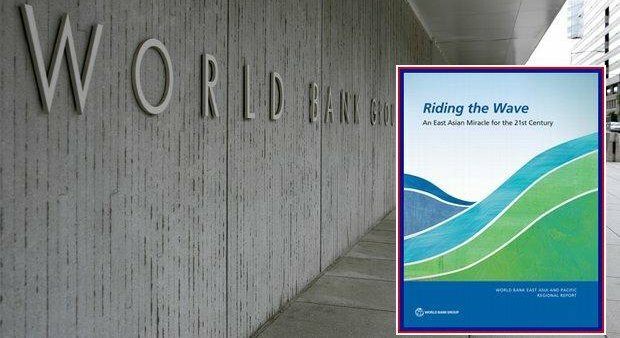 "The richer countries, which include Malaysia, Mongolia (at a lower income level), and Thailand, have continued to move large numbers of the economically vulnerable into economic security, and they are now characterised by large middle (and rich) classes," the report said. The second priority is to enact reforms that narrow the rural-urban and cross-regional disparities in economic and social development, which in turn will require increased or more efficient resource mobilisation. The report uses a five-part grouping of countries and recommends policies tailored to each. Although the middle classes benefit from the social protection measures such as health insurance and pensions that often come with secure jobs, they are not immune to systemic shocks, the report said. For example, 70% of the estimated US$47 billion (1.5 trillion baht) in damage and losses during Thailand's 2011 floods was incurred in manufacturing, which employed many middle-class workers. Porametee Vimolsiri, secretary-general of the National Economic and Social Development Board, said the ranks of the poor in Thailand have declined significantly over the past 20 years, thanks to the country's economic growth and myriad state policies designed to help raise incomes. The government aims to upgrade 29 million low-income earners to the middle-class level within 20 years, as stipulated in the country's 20-year national strategic plan (2017-36), he said. Those 29 million people are mostly farmers and labourers at small and medium-sized enterprises. Low-income earners are defined by the Finance Ministry as those who earn less than 100,000 baht a year.